No prizes for guessing who felt the most uncomfortable at the end of this reunion of former CD Tenerife coaches. 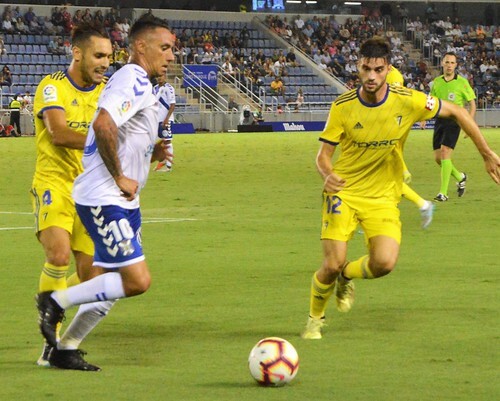 Jose Luis Oltra was basking in the satisfaction of a 1-0 victory, back on the home bench ten years after his first spell as boss, Alvaro Cervera was nursing his wounds on the wrong end of that scoreline to continue the recent decline of his visiting Cadiz side. 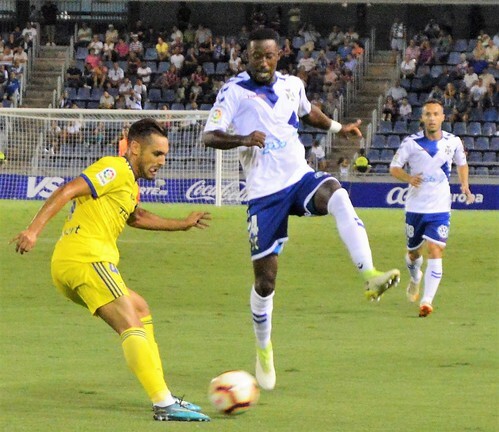 It was no time for gloating though, Tenerife did just enough to get their first win of the season, and Nano got his first goal since returning in the summer. It wasn´t a thriller to watch, Oltra stuck to his five man defence with a few tweaks. Alberto became the stay at home centre back with Carlos Ruiz roaming in front, that worked better but at times players seemed unsure of their roles. Alberto put his previous weeks poor display behind him, a strong block on striker Mario Barko marked his card. Nano is gradually finding his fitness and some form, a quick break showed his alertness but fizzled out with no support on hand. A patient build up just before the half hour took Tenerife close, Suso was back in the starting line up and running at the visitors defence, this time they ganged up to close him down. You can´t keep Suso chained for long, a couple of minutes later he was off down the right again, passed to Naranjo who helped the ball on to Nano who finished with a neat side foot for a 1-0 lead. Cadiz needed something from the game to stop their poor run, Matos thought he was through, Carlos Ruiz had other ideas and cleared with his head. Dani Hernandez was on top form, he easily repelled two decent shots on him. Jorge is learning to enjoy his little excursions to the sharp end, he produced another goal bound header only to see the keeper make a good save just before the break. 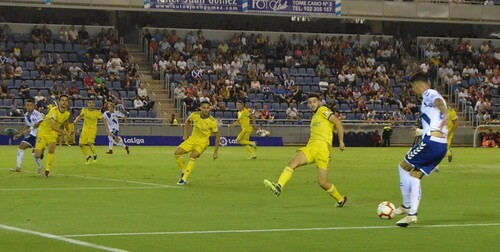 A home lead with a 10,075 crowd behind them should have made the Tenerife confidence flow, instead some of the old uncertainties reared their head in the second half. Naranjo was very poor again, Camille should have had a shot when holding the ball, instead he passed to Naranjo whose control let him down. Suso and Nano both forced corners that brought no reward. At the other end, defensive slowness gave Edu Ramos a chance, his poor strike was worthy of Naranjo. Nano was trying hard, he skipped past a defender and won another corner, again it was wasted, set pieces need a lot of work in the next training sessions. 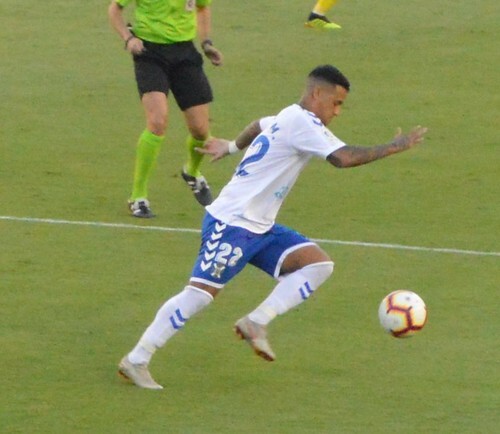 Tenerife were living dangerously, they should have pushed more for the second goal, Montañes came on for Naranjo but didn´t make much of an impression. 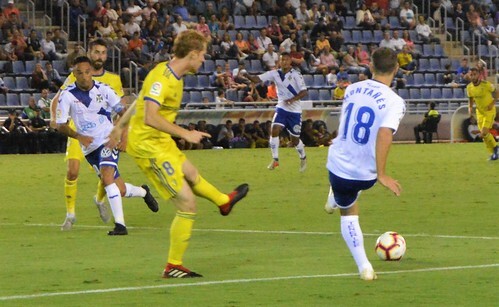 Undaberrana was a defensive replacement for Nano with 13 minutes to go, a signal to Cadiz that Tenerife were just looking to cling on. At least Nano got plenty of cheers as he left the pitch, the local boy will appreciate the fans are letting him back into their hearts. Suso tried his luck with a back header before making way for Malbasic. In injury time Luis Milla made light work of defender Alex Fernandez but Bryan Acosta couldn´t finish off the move. The win was a great relief and moved Tenerife up to 15th, but now the hard work really starts.